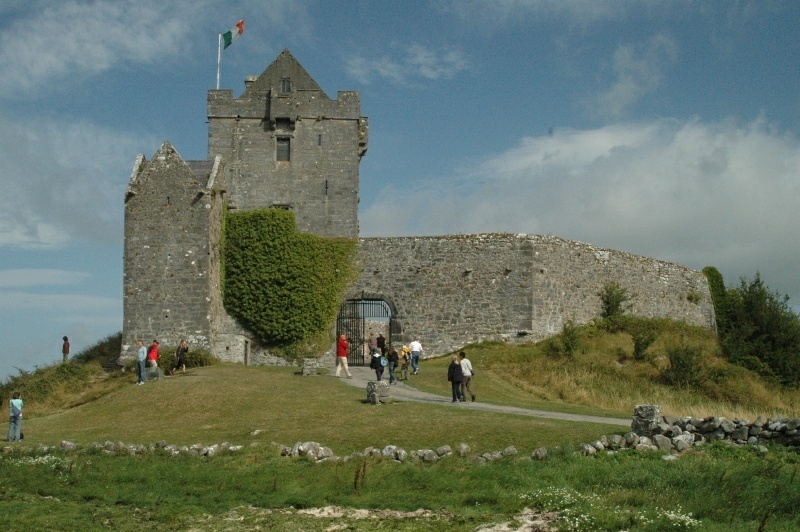 At the start of our stay in the Burren, we partook of Castle Dunguaire's "Mediaeval Banquet," which Rick Steves touted highly in his travel books/tapes about touring Ireland. We didn’t take cameras to the banquet, thinking (rightly) that it would be too much of a hassle. The banquet and entertainment were very good, and we had a pleasant time talking with a couple from New York State, first names Val and Larry. The total number of attendees at the banquet was, I estimate, about 80 – almost all Americans, it seemed, including a tour bus load of middle-aged to senior drunken boors who frequently talked loudly and crudely throughout the live entertainment. Sadly, and pretty embarrassingly, this was not our only encounter with loud, boorish Americans during our month in Ireland -- nor did we encounter any other nationalities behaving so immaturely.